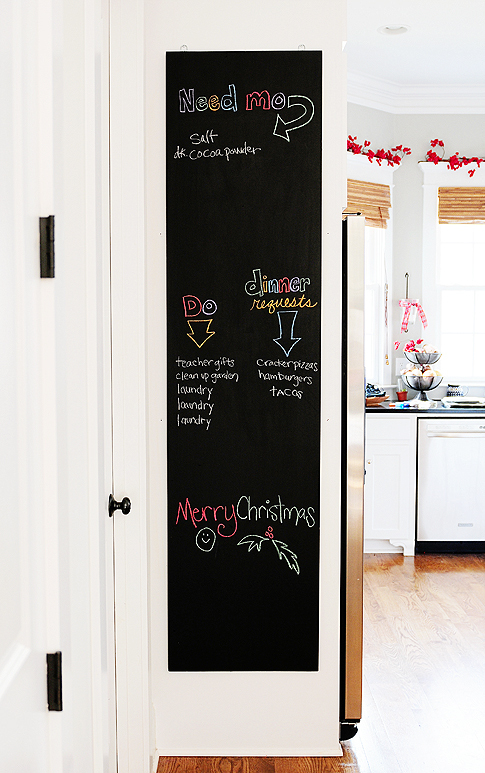 Having a chalkboard in your home can be fun and functional, and it’s easy to make a DIY Chalkboard for any area. I’m a doodler, and a list maker too. I have list of lists, and pieces of paper scattered around with my to-dos, groceries to get, and random reminders. After realizing that my lists were fine and dandy for me, what I’ve realized is that the rest of the family’s requests were not making it to my list. And my list is the one that requests ultimately need to be on if it’s gonna get got, because I’m the getter or the getter sender. Got it? Good.Anyway, I decided to make an attempt at getting all our lists together on one giant list. I settled on a DIY chalkboard, conveniently placed in the heart of the kitchen for everyone to access. I’m pretty handy with things, but I’m also blessed with my own handy man, Randy, who also serenades me with song, and can do a mean shadow puppet on the fly. Handy Randy took charge of this one for me. I told him what I was thinking as far as size goes, and that I wanted a simple chalkboard without a frame, nothing fancy. It was done in no time. Wanna see how? Randy purchased the wood at our home improvement store. We used a 3/4″ x 20″ x 8′ pine board (poplar would be nice too). It was already the perfect width, so while at the store, he had them cut it down to the correct length, which saved some work time back at home. He began with a good coat of primer. We had some tinted primer left over from another project, as well as an old paintbrush. It’s always nice when leftovers come in handy. 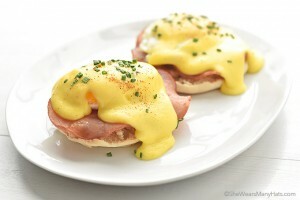 The primer doesn’t have to be tinted, it’s just what we had leftover. 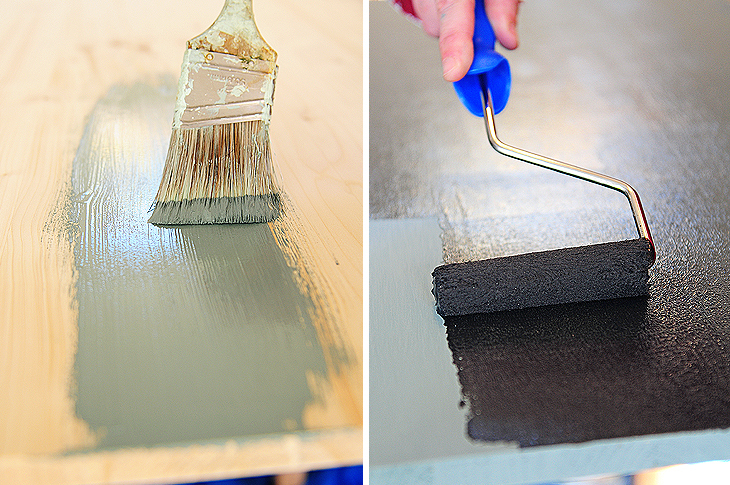 Once the primer was dry, two coats of the chalkboard paint were rolled on, with proper dry times in between each coat. When everything was dry, Randy attached basic d-ring hangers (similar to these) so the chalkboard would hang flat. The hangers are hardly noticeable, so I haven’t messed with them, but they could easily be painted the wall color in order to blend in, or fancied up with bows or the like. That’s it. What a quick and easy project. Now we have one giant list for everyone to use. No excuses now for me to forget the milk, huh? In addition to the grocery list, it’s fun to leave notes for each other, and get input on dinner ideas as they think of things. 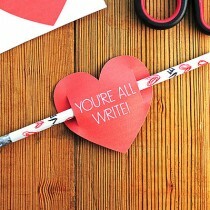 What a great gift this would make with a box of colored chalk and an eraser. Or maybe a fun addition to a child or teen’s room? I can think of a few other places where a chalkboard would come in handy. Do you have any chalkboard ideas to share? Please do! Looks great! Kudos to both of u! For *lots* of chalkboard ideas (i have a few but no completes,per usual) check out “you’re talking too much” & “my repurposed life” on Blogger. Gail&Reb chalkboard lotsa stuff! And I saw a gr8 idea at Instructables for holiday parties- chalkbd paint the bottom of wine&beverage glasses&put out pretty chalk so guests can ID their glasses! Isnt that kewl? Espec since cold&flu overlaps holidays. Just remember to prime your paint per directions when all dry! Rub chalk all over&buff off so accepts chalks better for use. 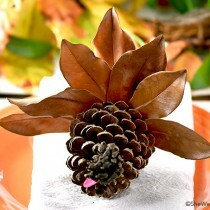 Very merries to all! If I had writing as pretty as yours, I’d paint my whole house chalkboardy! My teenager has said more than once how cool it would be to have a chalkboard wall in her bedroom. I love the idea of making one with plywood and hanging it on the wall. So easy and when she doesn’t want it anymore, it’s so easy to remove! Thanks for the how-to! Thanks for sharing this, Amy. A few months ago I purchased a huge chalkboard from our church’s yard sale. The chalkboard is pretty old and green with a beautiful wood frame and a wood stand. I got it for $5! My hubby just took it off the stand and mounted it on the wall in my kitchen/breakfast nook. I love it. We use it for notes and school work since we homeschool. I’ve been thinking I may refinish the chalkboard with this paint. I’ll have to see if they have it in green. Love this idea! I’ve always wanted to do a whole wall in my kitchen with that stuff. I LOVE that Amy!! I wish I had a good spot to do that in my kitchen!………..love your doodles! Like this. have about 3 places i could use it. thinking a calendar would be a cool chalk board. This is awesome. Way to go, Randy! I have a friend who used that chalkboard paint on the wall of her kids’ rooms. Now it’s okay for them to doodle on the wall and they love it. I love this chalkboard, Amy!! So much cuter than my ratty ol list stuck on the fridge. Awesome! And this may sounds like a crazy question… but what kind of chalk do you use??? 🙂 Mine never looks so bright! It’s just colored chalk from an office supply store. Nothing fancy. I just pressed kinda firmly when writing. AND the board being totally clean makes it pop too. Working on a big one in my kitchen, too. How about listing different wines that you want to try? Or who’s day for for dishes? (not fun! ha) Merry Christmas, Amy! Hope you have a fantastic week! 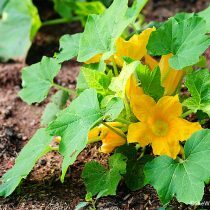 I dont think I could love this more… just beautiful and wonderful and I think maybe even I could tackle this Amy!!! 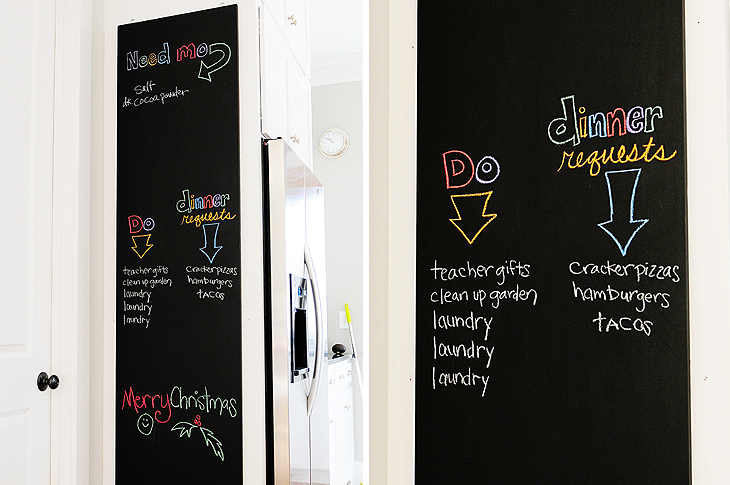 One day we will have a chalkboard wall in our home! Such a great idea and your doodles are perfect, too! You found the perfect spot in your kitchen for it! love, Love, LOVE! I was thinking about this but then worried it would look muddy when I erased things. Do you just use a sponge to make it look shiny and new again? I’ve just been using a slightly damp paper towel to wipe it clean when I start new, with a blank board again. In between, I use a regular, old fashioned eraser to “mark” things off the list. I love this! I spray paint lunch boxes with chalkboard paint and fill them with cookies! So cute! Does it erase easily, or does it leave streaky streaks? I’ve been using a regular eraser most of the time and it erases fine, but to get it neat and clean and really black (because I like the way it looks), I just use a slightly damp paper towel and wipe it down. 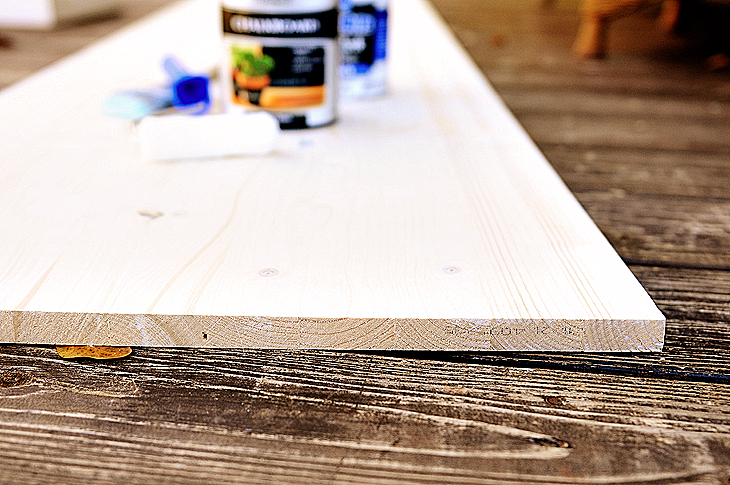 Also, read the comment above from Susan about priming the board, etc. Ooooh! thanks for mentioning the “priming” step. totally overlooked that! You are awesome! Love the chalk board in such a convenient location that everyone can reach. I think I might need to ring a bell for my full time handy man to do the same for me! That looks so nice in your kitchen Amy! Love, love, love making my own chalkboards. I have an old mirror that I’m working on now for over my desk. love this! i created a dry erase board not long ago because we needed a place to write it all! this is fantastic for my kid’s play room! My hubby once painted an entire wall in the boys’ bedroom with chalkboard paint. It was pretty awesome except for when we had to paint over it…. We have a big ol’ school house chalk board in our kitchen. I write the week’s schedule on one side and other random things around. I also write any names of family and friends who need prayers. Then whenever one looks at the board, that person is remembered and maybe even a little prayer is sent! Merry Christmas! I love this! I’m a list maker too and at least one gets misplaced or lost every week. This would be a great solution! I doodle and make a lot of list too! I love this chalkboard! Not as cool as it seems. I’m an architecture student, and we painted two wall sections of homosote, with this paint, and it’s hard to erase the chalk off of it without the chalks colors becoming like a layer of dust over the top. We have tried washing it and everything, but it’s very very hard to get satisfactorily clean. Hmmmm…that’s curious. I’ve used just a damp paper towel and it comes very clean, like new. I wonder if it depends on what kind of chalkboard paint is used? Or the surface that is painted? When I had an actual chalkboard in my classroom, I put a small amount of Old English furniture polish on an old dish rag and used it to clean the boards. Rub it in really well so there are no oily spots. If you store the rag in a ziploc baggie, you can reuse it many times before having to add more oil to the rag. Grocery list? My fridge is white and has a relatively smooth finish. As it turns out it makes a perfect White Board! Viola! I scared my kids loling! At a glance I thought the menu said CRACKBURGERS!!! I forgot all about the board for a second! Thanks for the laugh. I have something similar on my to do SOON list! LOVE THIS! Many sign companies also sell black board vinyl. Peel and stick. It comes in many sizes and can be cut to a shape too. i home school my 2 children. and i have been looking for places that i can buy a chalkboard. but they want a lot of money and they are all to big for what i want to use it for. so with your ideas i am going to make one for us. at the size we need. and have the kids help it will be a fun art project for them. I know that they will love it. Thank you. What a great idea. Now I just need to find a spot in my kitchen. This is a great idea! I can’t wait to move so I can do this 🙂 Keep up the great work. I’ve seen chalkboard paint a lot since joining Pinterest and it makes me want to alter and make so many things. I love the ability to make any surface into a chalkboard. My family always had a whiteboard that was the same purpose as your chalkboard is (it also had doctor’s appointments on it so we knew where each other was). I always liked having that main board to look at because it really did have everyone put in their part, and no one was forgotten. Plus, you’re right, writing notes to each other or drawing doodles was a favorite thing for me to do. 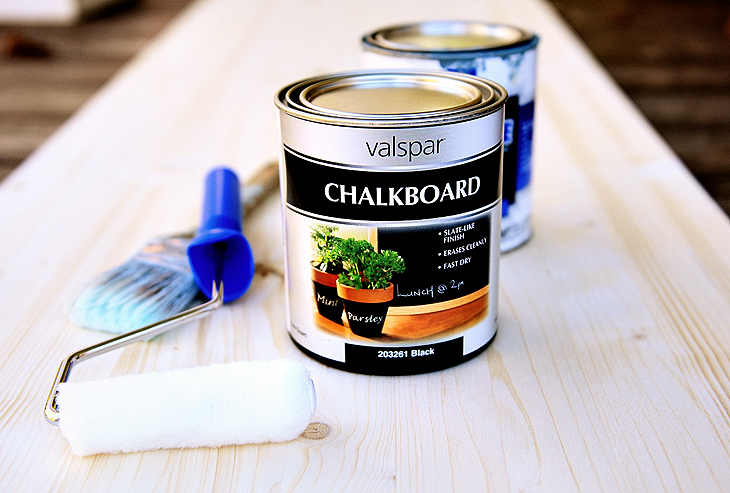 Does the chalkboard paint have a strong smell? And does it take longer than normal paint to dry? Such a simple yet wonderful idea for a kitchen. I have a spot that I wanted to put a chalkboard in but have been trying to figure out how to do it to fit my needs. Thanks for extremely easy tutorial. Wow! I love this idea! We are moving into a new place that has a chalkboard wall. I wondered what in the world we were going to do with it. But putting grocery lists, and to-do lists will be perfect! This idea is basically the same but if you’re short on wall space this works great, all you do is paint the inside of a kitchen cabinet and presto you have a note board ,the chalk paint also comes in spray cans that works well also. Great idea, Cindy! I’ve never tried the spray can chalk paint, but I sure can think of a million uses for it. Pingback: The Best Window Cleaner ever ... like ever.